Despite innovative efforts by government wordsmiths and designers, agency grades in jargon-free communications dropped from a B average to a C last year, according to the 2018 report card released on Friday by the nonprofit Center for Plain Language. One possible reason: high turnover during the past three years in the two key job slots at most agencies required by the 2010 Plain Writing Act, which mandates that agencies take concrete staffing and training steps to make writing clear, concise and well-organized. In this seventh edition of the report card, the judges looked at writing quality and compliance with the law by analyzing offered samples and most frequently used website pages from 23 agencies. They found a “notable drop” and that 10 of the 11 agencies that fell a grade in the area of organizational compliance with the act also declined in writing quality. Standout agencies that earned A grades in both writing quality and organizational compliance included the Agriculture Department, the Small Business Administration and the Social Security Administration. High grades for graphic presentation were acknowledged specifically for the Defense Department’s TRICARE website, Social Security’s My Account page and USDA’s Choose My Plate page. 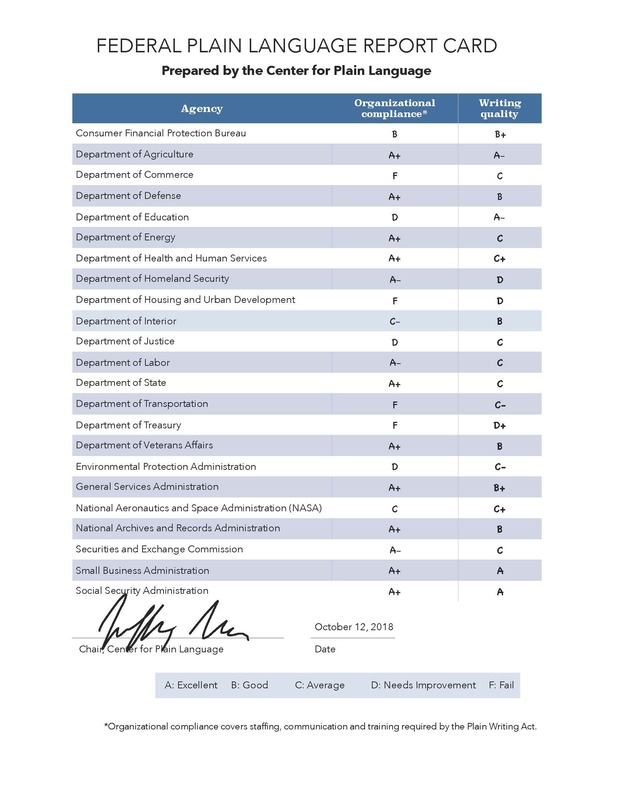 Agencies that received F grades in organizational compliance included the departments of Commerce, Housing and Urban Development, Treasury and Transportation. Those receiving D grades in writing quality included Treasury, HUD and the Homeland Security Department. The chief problem, Lipscomb added, is that too many agencies ignored a plain language principle of focusing on the audience. “On too many homepages, self-promotional news crowded out tasks and information for users, while jargon and acronyms stayed entrenched,” he said. 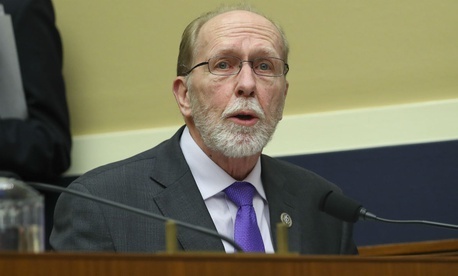 Loebsack cited as a good next step passage of a bill on simplifying regulations that he introduced with Reps. Seth Moulton, D-Mass., and Mark Meadows, R-N.C., acknowledging that these are unlikely bedfellows. The Too Long; Didn’t Read Act (H.R. 5321) would require the Office of Management and Budget to develop and issue regulations that direct each federal agency to provide a clearly-marked section at the top of a communication (both hard copy and electronic) that the agency sends to an individual if such communication requires or authorizes the individual to take action.